The letter H, equivalent to number eight in numerology is synonymous with power, creativity, and wisdom. This number has influenced several revolutionary figures, including those who sacrificed themselves to support the poor and oppressed. H girls have the capability and vibrations to give much to the world because they are stable, efficient, reliable, and independent, precisely the kind of people the world needs more of. Number eight people also stand tall in adverse situations. In fact, the more difficult the situation, the more they rise to the occasion. H girls are sensitive and patient by nature and work really hard to achieve their goals. They tend to see the bigger picture, that too, from a higher perspective. The letter H also brings with itself creative skills. So it would be a very good idea to encourage your girl’s artistic skills if you happen to pick this letter for her name. However, it’s advised that girls with this letter in their initial should fight any doubt they have and spend most of their time outdoors. 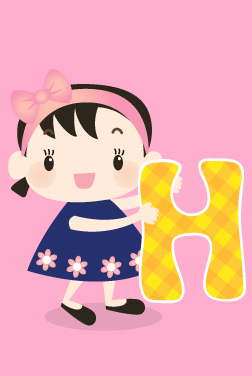 Below is MomJunction's list of baby names starting with the letter H. You can find meaning, origin, and religion for each name just by clicking on it.